This is a public service request for Epsom & Ewell Borough Council and National Rail. 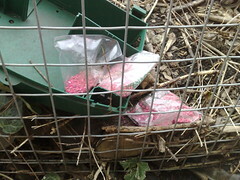 This rat trap has come open behind the fence next to the footpath between the Ebbisham Centre and the Railway line. The bags with poison are marked as such, but that may not be obvious to smaller children or other animals who take a fancy to the pink sweetie-looking things in the bag. How does this get sorted out, please? UPDATE: So I tweeted about this and almost immediately got something back from Al Green saying to let the Network Rail helpline know. I misread this as the National Rail one, as I’m somehow unable to let go of the idea that it was their responsibility. I got something back from them quite quickly, saying, thanks, but it’s not our patch guv, talk to *Network* Rail. I left a message through their online form too and got a call from someone on Tuesday afternoon to say that they were sending someone along to have a look. Sure enough by Wednesday, all the traps had been removed. So now I’m looking forward to our little brown friends recolonizing, getting their yummy treats from Jimmy Spices bins and taking them back into the undergrowth to tuck in. So it seems to work, though it would have been quicker if I could learn to read properly. East Street is the A24 going out of Epsom. For the last couple of days it’s been almost empty at 6 o’clock because the road was covered in snow and no-one seemed to be going anywhere anyway. It’s been nice walking along with no traffic. Today seemed to be the day that people either thought it was safe enough to drive or decided that they couldn’t get away with another day off. Either way it’s back to normal, and we should be glad, right? We should be glad when things get back to normal. So I am.